Photograph from the Archaeological Survey of India Collections taken by Henry Cousens in the 1880s. 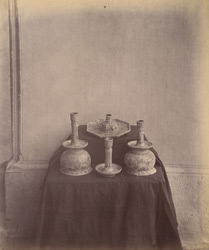 This view shows some of the old china candlesticks that were found in the Chini Mahall in Bijapur. This ware was imported from Persia and China. The Chini Mahal took its name from the glazed tiles that used to decorate the building.